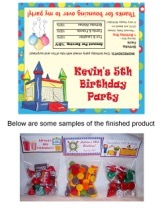 Bounce party favors include birthday party invitations, thank you note cards, return address labels, envelope seals, goodie bag labels, and goodie loot bag toppers. Inflatable moonwalk. Boy or girl. Castle design also available.